We note that many people arrive here with search keywords for Infantry Tactics. There is much more on the Drill Network for this subject then you will see here. 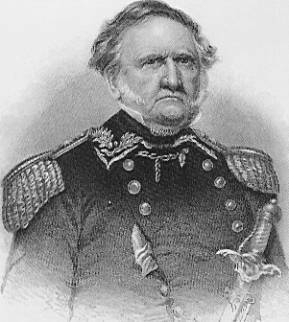 For the many Americans whose knowledge of our history basically skips from the American Revolution to the American Civil War, Winfield Scott is little more than a footnote. He is remembered as an aging, overweight military bureaucrat, out of touch with the reality of the situation. While this is in itself a false and unfair view of the man, it patently ignores his brilliant career. It ignores the vital and brave young man who defended his country against British invasion in the War of 1812. It ignores the mature military mind that drove a brilliant offensive campaign to Mexico City with an outnumbered army. Scott was removed from command, not because of incompetence, but because he saw clearly that the Civil War would be a long and difficult one. It was his so-called "Anaconda Plan", which, when finally applied, did indeed strangle the life out of the Confederacy and end the war. This page salutes General Scott, not only for his active military career, but more so for his contribution to the development of military drill. We present here his masterwork, the three volume Infantry Tactics. This system was that which was used to train all of America's soldiers until the adoption of Hardee's in 1855, and still retained much currency thereafter in pre war militia units. An understanding of Scott's is most important to understanding how the citizen soldier was trained in preparation for this terrible conflict. The project is now complete. The Plates for Evolutions of the Line are of awkward size for scanning, and are of poor quality. Still, the Explanations themselves are most valuable. It is divided into several parts, as seen on Site Navigation. This transcription could not have been made by your webmaster without the generous donation of a photocopy of an original from the collection of Paul Kenworthy, an excellent student of drill. Thank you Paul! The first volume has been divided into three parts, which can be accessed from the links below. School of the Soldier and School of the Company have internal links, found at the contents portion of the document. Click on the Title II or Title III link at the top of those documents to find the links. Scott presents his Table of Contents at the end of Volume I. When time allows I will use this to create a more specific site navigation tool. For now, it will be presented here for completeness. The text, all plates and music are complete through the first volume. The plates for School of the Company are of particular interest for the excellent explanations detailing the movements illustrated. School of the Battalion is now complete. The internal links, while not as comprehensive as might be hoped can be found from the SITE NAVIGATION link. The internal links for the Instruction for Light Infantry and Rifle, or Skirmishers, are more comprehensive, and can be accessed in the same manner as above. The Table of Contents is presented for completeness. The Evolutions of the Line are the General's directions for Generals. Click on Site Navigation at the top of the page for the internal links. The Plates are now online. As usual, the commentary on the plates is perhaps of more interest than the illustrations themselves. Formation of a Regiment and General Instructions.